It has been exactly 2 years since we posted our first interview with Ben Taverniti, creative director and designer of famous and super beloved HUDSON jeans. We were curious and wanted to know how much of Ben’s “dreams” for Hudson became reality, what has been happening in theses 2 years, and how does Ben see the future for Hudson in the denim market. A: For the Fall ’14 season we’re seeing a continuation of the Moto and Zipper detail trend as well as Plaid and Pinstripe patterns. Animal Jacquard is a strong trend for Fall ’14, with leopard, snake, and alligator prints that have texture and are tonal. A: New silhouette Evelyn is a super skinny pull on, with a back zip – this is the next big style for Hudson. The Barbara, a high waist super skinny, is our new basic. Regarding our next big fit trend- the Jude Slouchy Skinny – is seen again for the coming Fall ’14 season. A: Jacquard fabric, in both denim fabric and ready to wear fabrics, are important for Fall ’14. One of Hudson’s most exciting innovations for Summer ’14 is the new DBC fabric in Black Knight. It’s a reform stretch, its clean easy, light weight and a soft hand. We offered in the following styles in summer and it will continue on through Fall. A few Summer ’14 silhouettes that we made in this fabric are the Stark Moto, the Krista Super Skinny Crop, as well as the Beth Baby Boot. Q: Do you believe and agree that generally women are kind of getting tired of too much stretch and are ready for more “authentic” denim, maybe even selvedge? A: I agree with this, however this is why we’re always looking for fabric that has the rigid look with the comfort and feel of stretch fabric. Q: Will prints still be strong for the next few years? A: Yes, but we should be expecting more tonal prints with texture, like we see with the animal jacquard. Q: What are your predictions for the men’s denim? 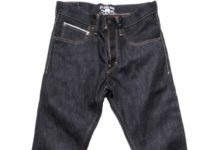 A: For men’s denim we should expect more zipper and military details, as well as variations of the leather pant and sweatpants. Q: Do you believe in stretch jeans for men? 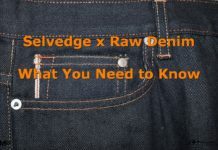 A: I do believe in stretch for men’s denim which is why we always look for fabric with the look of selvage denim but with comfort that stretch provides. Before I came to the US I was only wearing rigid jeans and now I only wear jeans with stretch – especially in the skinny and slouchy skinny silhouettes. A: The harem sweatpant with full length asymmetrical zippers down the sides. A: Our mission is to help people look and feel amazing so that they are inspired to live their dreams and to be real. Hudson will be one of the key leaders in the global community by finding ways to make positive impact and forever changing our world. Our method is simple… living up to our mission and delivering product to validate our purpose.